POP EVIL has announced a brand new batch of 24 U.S. headline dates for next year in the never-ending support of their self-titled LP, which was released earlier this year. Veteran comedian and former VH1 That Metal Show host Don Jamieson will serve as direct support. THEM EVILS and SAVAGE AFTER MIDNIGHT will open the tour on select dates. 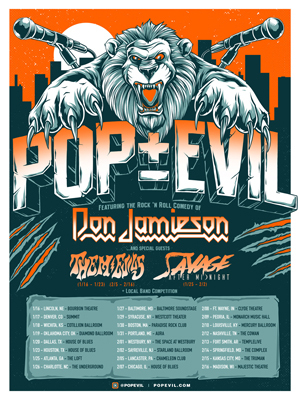 VIP ticket packages and a Bandsintown pre-sale will be available starting Wednesday, October 17 via Pop Evil’s website. Public on sale will be available this Friday, October 19. POP EVIL is launching a contest which gives local bands a chance to win a slot on the bill. Bands in each city can submit an original cover of POP EVIL’s latest single, “Be Legendary” and be in the running. The contest begins in November - stay tuned on POP EVIL's social media pages for more info. This announcement comes on the heels of POP EVIL announcing a Canadian headline tour dates in Canada. Dates will kick off on November 17, 2018, in Toronto at Lee's Place hitting both coasts before wrapping up in Saskatoon at the Coors Event Centre on December 3, 2018. New label-mates ROYAL TUSK will support.